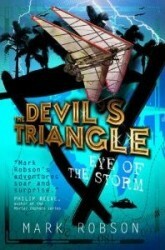 Sam and Callum are stranded in the strange parallel world, having been pulled across by the dangerous energy of the Bermuda Triangle. Now they have found Sam’s mum and joined her rebel group, who are trying to stop the raptor species from creating even bigger holes in the fabric between the two worlds. Sam is still desperate to find a way home, but how far will he go to get there? Meanwhile Niamh is trying to uncover the truth about the boys’ disappearance. Convinced that her brother and Callum are alive despite the authorities suspicions, it’s up to her to solve the mystery before her father is convicted of murder.